My grandmother taught us how to make Rice Balls, wasn't sure if that was really a Sicilian thing but they are wonderful. Sounds great John! I have never heard of it. Care to share a recipie? hey John, can you give me your recipe for rice balls please? My husband (who is sicilian) loves them It's his favorite. He hasn't had it much since we left New York. Here in Texas no one knows what they are. We have a great pizzeria here where we live (Houston). The guy is from Brooklyn where I grew up and his food is delicious. Just like back home. But he doesn't make rice balls because they don't sell as the people here have never had them. He makes them for his family during holidays and saves a tray for my husband. But that's like 3 times a year. I'd love to give it a try if you don't mind posting. Thanks! Suga is actually SUGO and it's Italian for sauce...thats what we call it too. In Lombardia these are called 'suppli' (sooplee), and sometimes 'arancie' (oranges), but up here they are not eaten with sugo. They are quite large and are eaten as either a 'starter or as a 'contorno' (side dish with main course). When I make a risotto with saffron and mushrooms I make plenty and the extra I leave for the next day - Then to prepare I just add an egg, mix it well (using my hands) then make the balls (up to about 2" accross), dip them in beaten egg, roll in the breadcrumbs and fry in really hot oil. N.B. It can be made, and is just as tasty if you replace the mushrooms with some chopped ham! Risotto alla Milanese con funghi. I was given quite a lot of 'local' fresh porcini to freeze for the winter - so I'll try some next week when I make my risotto... I've always used the dried ones, from habit I suppose - I was taught how to cook this risotto using them. You made me hungry at 10.00 a.m. in the morning!!!!! PreparazioneIn una pentola capiente versare l'acqua, il riso, lo zafferano sciolto e i dadi. Mettere sul fuoco (abbassate la fiamma dopo che prende bollore) e fare cuocere fino ad assorbimento dell'acqua, mescolando di tanto in tanto (se usate il brodo pronto non usare i dadi). Spegnete il gas con il riso al dente e mantecare col burro e il formaggio. Fate raffreddare bene il riso e amalgamatelo con l'uovo (sarebbe preferibile cuocerlo al mattino per la preparazione al pomeriggio). Preparate il ragù con il soffritto, l'olio, la carne, sfumando con il vino. Aggiungete il concentrato di pomodoro sciolto nell'acqua e i pisellini, cuocendo per una ventina di minuti circa. Quando tutti gli ingredienti sono pronti preparatevi una ciotola con l'acqua fredda per bagnarvi le mani, una scodella col il pane grattugiato per passare gli arancini, un vassoio dove sistemarli man mano sono pronti. Bagnatevi le mani nell'acqua, prendete una manciata di riso, fate una pallina con entrambe le mani (poco più di una pallina di tennis) e con l'indice fate un buco allargato quanto basta a contenere un cucchiaino di ragù e due tre cubetti di mozzarella. Richiudetela bene, aggiungendo qualche po' di riso se occorre e passatela nel pane grattugiato premendo bene con entrambe le mani. Proseguite fino alla fine degli ingredienti, dovreste avere dai 32 a 40 arancini. Friggeteli immersi in olio bollente finché si forma una crosticina dorata (il colore dipende da voi se li volete più o meno fritti). They BOTH look delicious! ........it's 7:55am and you've both made me hungry!! I'll be interested to see Johns recipe. As for the sauce.........my mother always put sugar in hers and I put it in mine too. Just enough to cut the acidity of the tomatoes. Hey Gina I live in Katy Texas so we must be neighbors! Gina what and where is your Pizzeria I would like to go there! When everything else is ready, lightly beat the remaining eggs and season them with salt and pepper. Then, preheat your oven to 350 F (180 C). Next, make the first arancino by taking two small handfuls of rice and shaping them into hollow hemispheres Fill the hollows with some of the meat, and some of the peas, and mold the two halves together to obtain a smooth-sided rice ball about the size of a small orange (1.5 - 2 inches in diameter). 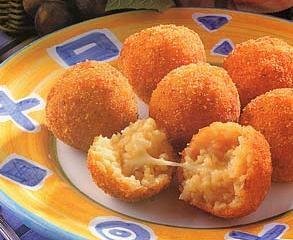 Roll the arancino in flour, dredge it in the beaten egg, roll it well in the breadcrumbs, and fry it in abundant hot oil. While it's cooking begin with the next, and when the one that's frying has become a golden brown drain it on absorbent paper. When you have finished frying all your arancini, heat them through in the oven for five minutes, decorate them with the orange leaves if you choose to, and serve them piping hot. Wow1 Thanks Laura - I think I'll try these. Hey John! That's so funny! What are you doing in Katy? Don't you know the Italians in Houston live in the Bay Area and Galveston? I am in Clear Lake. You MUST try the pizzeria. It's called Pomodoro's. A bit of a hike for you but certainly worth it. Take I-45 south to Nasa Road 1. Go east (left) on Nasa Road 1. It's on your left side about 4 or 5 miles down. Definitely worth the trip. Lou, the owner is from Carol Gardens, in South Brooklyn (Lori...our territory). Just before Pomodoro's is a restaurant called Frenchie's. Best Italian food in Houston. Hands down. Hey, let me know if you go and what you think.